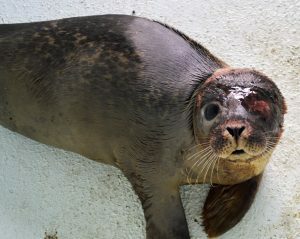 One lucky seal at our Marine Rescue Centre has been given a second chance after horrific injuries. 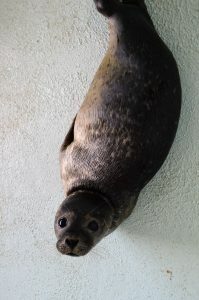 The seal, named Helena by her rescuers, was brought into the rescue centre at the end of July. She had been caught in some ‘ghost’ fishing gear and has multiple wounds. Found at St Mary’s island in Whitley Bay, Helena was in a dire situation when she came in. After freeing her from the fishing gear and treatment of her wounds Helena looked to be on the mend. However, complications due to her injuries were about to make her situation a lot worse. 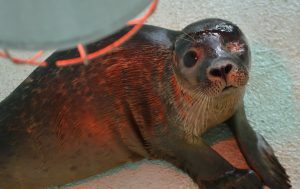 In August the team noticed a problem with her left eye, this had been caused by the fishing hooks which she got tangled in and the damage to her eye was irreversible. Unfortunately Helena would need an operation to remove her eye if she had any chance of survival. This in turn added more risk as she would need to be put under general aesthetic. Helena was taken to a local vet for the operation and happily everything went well. Helena awoke from her surgery and is now back recovering at our rescue centre. Even with only one eye the team are confident Helena will do well once she is released back into the wild. Helena still has some treatment to go and the team hope to release her back into the wild in the coming weeks. Helena was lucky that she was found and brought in for treatment. With her injuries it is unlikely that she would have survived if she was left in the wild. The injuries caused by discarded fishing gear highlight the dangers of marine debris, especially fishing gear. Make sure you stop by our rescue centre on your next visit and check on Helena’s progress. We hope to have her well enough for release in the coming months!